Rail services in the South West are in line for big changes, with some cuts while other routes are improved. The Strategic Rail Authority (SRA) said the new Greater Western franchise, due next April, would offer more high-speed trains and improved services. Among changes are a "surfers' express" service between Paddington and Newquay. But cuts are also planned, including the off-peak Paddington to Exeter route, some Paddington sleeper services and Par to Newquay branch line stops. 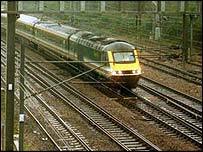 The SRA announced that there would be more high-speed trains and improved frequencies on parts of the new franchise when it began in April 2006. But under the SRA proposals, there will also be a reduction in service on some under-used routes of the franchise which combines the existing First Great Western, First Great Western Link and Wessex Trains franchises. Improvements within the new franchise will include more 125mph trains and additional peak-hour seats in and out of London. A new daily inter-city standard service between Paddington and Newquay is being brought in to "reflect the nature of passenger demand to this destination". But the SRA added it was making other changes "where demand levels no longer justify taxpayers' support for the existing level of service". These included the withdrawal of off-peak Paddington to Exeter semi-fast services and the reduction of stopping services on the Par to Newquay branch. The SRA is also requesting those bidding for the franchise to outline the costs of running the overnight service between Paddington and Plymouth/Penzance. Bidders for the new franchise include First Group, which already runs Great Western and Great Western Link; Stagecoach Group, which runs South West Trains; and National Express Group, which runs Wessex Trains. The SRA has now started a 60-day public consultation on the new franchise. The franchise will run for seven years, plus three extra years if agreed performance targets are met.